For the old-school coffee drinkers, Melitta offers a six cup manual coffee brewing system. 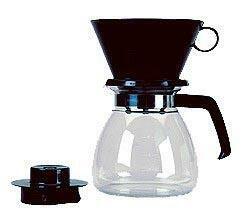 Its components are a cone-like filter holding device for the top and a carafe which attaches to it. You add the boiling water and others. This manual thermal coffee pot is extremely affordable at around 10-20 dollars. You might be asking why you would want to brew coffee manually this way instead of through an automatic machine. Well one of the major factors of brewing good coffee is having a controlled temperature. While coffee roast and grind quality and water are all factors, controlling the temperature is the most important. Electric coffee makers sometimes have problems with their internal temperature control or don’t get it right the way they are programmed, making it overly hot or cold. With the Melitta manual coffee pot you boil your own water therefore have complete control over the temperature of the brew and the amount of water that passes through the grounds. Although this adds a few minutes to the preparation time it is sure worth it. The Melitta manual coffee pot takes number six cone filters. Even though this is the case it appears to be able to take fold type filters as well. It is your preference as to what kind of filter you would like to use but white filters seem to be the best suited for this coffee brewer/pot. However, some people argue that white filters are bleached and contain dioxin which is a very powerful carcinogen. Both white and brown filters can be used. Your choice. The first step to preparing coffee with this pot is boiling the water. Ideally the best temperature for brewing coffee is 208 degrees Fahrenheit, so this is what you should aim for. Now place ground coffee inside the filter top that sits on top of the pot. Next add the boiled water. You will notice that the grounds will start to bubble as they are saturated with the hot water. Let this happen for up to forty five seconds and at least for fifteen because it will help the ground stay in place when brewing. After this you can either pour all the water through the filter which produces a weaker cup of coffee but is faster and distributes the grounds evenly in the filter. The coffee will be smoother as well. This is due because the water passes faster through the filter. Or you can pour the hot water through slowly while carefully not moving the grounds. This will produce a strong cup of coffee. The filter that sits on top of the pot can also sit on top of many other carafes. So if the carafe provided happens to break you could use another one you may have somewhere. I might check things out. I like what I seee so i am just following you. Look forward to going over y?jr web page yet again. additionally sharing in delicious. And of course, thank you on your effort! Yes! Finally something about largest stadium.